– Hi Jason! The whole staff and friends of ” iamretro.gr “, are very glad to have you here! Welcome on board! Studies: Left school at 16 and went straight into working for a great developer called Graftgold as a trainee programmer. I could already program the C64 quite well (had released a number of Compunet demos and so on) and was lucky that they were based in the same town that I lived in. Current Occupation: I’m the co-founder and director (and programmer and audio person!) at Shock Red Limited – A game developer, focusing on IOS games. I left Sony Computer Entertainment Europe in November 2015, after nearly 20 years. 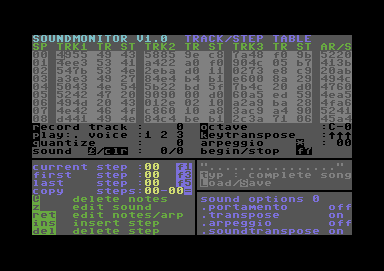 Hobbies: Writing music (I’m currently writing a lot of old C64 SID music again, just for fun! – Have you followed any special music courses/studies? – No, as with programming, I’m completely self-taught. My Granddad had a 2 keyboard organ when I was a child, and I used to like playing tunes on it. I’ve never learned to read music notation. I can read it well enough to, say, convert something to put it in a game. But not fluently, to be able to play along to it. Actually, I’ve never really enjoyed playing other peoples music anyway. I tend to just make up tunes as I go along. – OK. I started writing music on the Commodore 64. The first game I ever bought for it was Thing On A Spring. The music (by the great Rob Hubbard) blew me away. I had no idea how this computer could do that. The second game I ever bought was Rambo. Again, the music (by Martin Galway) was stunning. At that point, I kind of knew that I wanted to do that too! I used to write demos and music under the name “Jay (JP22)” and release them on Compunet. They weren’t that good, but I was basically learning three crafts: Programming, musical composition and an understanding of audio synthesis. That’s what was so great about the music by people such as Rob and Martin – It was the combination of these three elements that created the end result. They were all pretty much as important as each other. I used to write music using a number of different systems. Sound Monitor, Rock Monitor (both essentially the first tracker programs ever made), ElectroSound… To be honest, I never really got to understand the SID well. I knew how to make it do certain things, but I didn’t have the technical experience to understand how it worked. -There are some rumours that you fancy (or at least you used to…) “Sound Monitor”. Any particular reason(s) behind that? – It was the best thing available at the time. Simple as that. We’re talking 2 years before Maniacs Of Noise released Cybernoid. So it wasn’t like I could have used their routine or anything anyway. – From the very beginning of 2015, you “rushed in” CSDb, releasing your marvellous tunes…one after another! What urged you to this comeback? You’re naming them after a number sequence. “First, Second, Third…” Is there any particular reason for that? What’s your favourite? – I actually wanted to get back to SID composing for a number of years. Since being at Sony and working in the R&D’s audio department, I had a good 25 years to finally understand audio! I wanted to try some ideas out that I had for pushing SID. I knew I could probably make it sound different to what most people were still doing today. In July 2015, I had surgery, which resulted me in being off work for about 3 months. So, I had some time spare! So, I started writing SID music again for fun. My first release (FIRST) is very much a “standard” SID. It has the same instruments and structure as I was writing and hearing in 1990. I slowly started trying more and more different ideas (in SECOND, I tried to make a more interesting bass sound, and in THIRD I started playing with the ringmod to get a better understanding on how it worked. FORTH was where I really changed everything. I decided that if I could make the percussion sounds more “realistic”, then I’d effectively have a synth and a drum machine. For too long, people seem to have used the same techniques for creating percussion sounds (since Maniacs of Noise…). I think that a lot of people stopped pushing the SID, and the music (although great) seemed to be stuck in a rut. I knew FORTH was on the right track, as some people thought it was fake (using samples / multiple SID’s) – which made me happy! It was here that I also tested my theories for some of my percussion sounds. The hi hats and clap sounds were what I hoped would raise my SID’s to a new level. The hi hats especially, as these really changed the overall sound of the SID. Most SID’s don’t have those high frequencies. And the clap – well, it sounded like a real drum machine. So again, helped change the perceptions of a lot of listeners regarding the pushing of SID boundaries. As for the naming… I hate naming tracks! I’ve always hated it. Even my early music used to be called things like 1105 (I finished writing the track at 11:05 pm..) and so on. A year or so ago, I released a lot of the tracks that I wrote at Sony – Tracks that were only used for promo videos and so on, so not game soundtracks. I named these A,B,C,D… But, stupidly forgot that I’d only be able to release 26 tracks! So, for the SIDs, I thought I’d go for numbers… I’ve an infinite number that I can release now! My favorite is usually the last one I released. I’ve a soft spot for Turrican, as it was a port from the Amiga to SID (where the Amiga version had sampled chords and 4 channels), so getting this down to 3 channels was a challenge. It also only took a few days to do. I knew at that point that I was getting very comfortable with both the SID and the tool I was using to create the music. 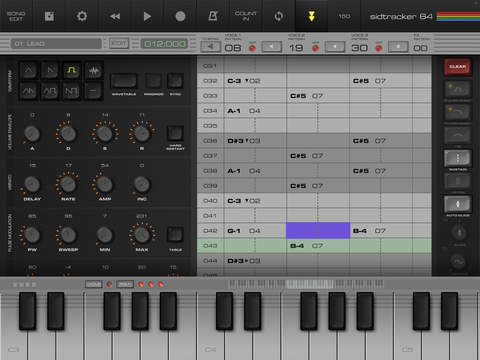 – Is it true that you compose using SIDTracker64 on an iPad? Would you like to name your current tools and give us a virtual tour (pictures, video, etc) of your studio? – Yes, I only use SidTracker64. After surgery, I spent most of the following three months in bed. 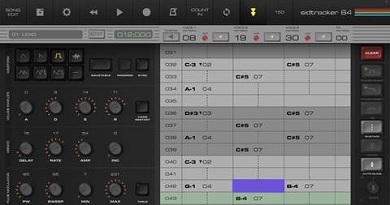 So I just laid there with an iPad and wrote music! Very refreshing, compared to using desktop setups. I’ve also got an app (TW Recorder) that allows me to normalize the resulting waveform from ST64 and upload directly to SoundCloud. So I could just do everything from the iPad and a pair of headphones. However, for releasing on CSDB, I now also use a PC, so that I can modify the SID details (adding my name), create the .PRG file and so on. So I’m also using PC for that. As for my “studio”. It’s an Apple Macbook Pro, running Logic X. I’ve also got Ableton, but haven’t really got around to getting into it yet. And I’ve a Novation 49 Mk2 keyboard. That’s it really. Oh, and a load of plug-ins and samples. The track ‘OK Lets Go‘ ( https://soundcloud.com/noothermedicine/ok-lets-go ) was written with Logic-X. -You did a stunning 64 version of the classic “Turrican” track for Amiga. “Turrican Amiga to SID“…Really Amazing! How did you manage to compose such a tune (equal to the original to say the least!) with less “horse” power? Any plans for more tracks? – I just learned a few tricks since FORTH. For Hybris (which I released before Turrican), I worked out how to reduce channels but keep the quality. So, I kind of knew that I could get the Amiga’s 4 channels down to 3 for Turrican. My main goal here was to write a track that didn’t use ARP’s (those instruments where it quickly changes between notes to create a chord effect). The Amiga version didn’t use them, and I felt that if I had to resort to using them in the port, then I would have failed. It would have just sounded like a C64 version of an Amiga track. I wanted it to sound just like the Amiga track, if not better! It only took 2 days or so to write. The main problem was trying to get the chords to work, without them cutting out the melody line and so on. It all comes down to basically tricking the listener. I could remove one voice for another, and as long as it wasn’t *that* noticeable, I could get away with it. Kind of similar to how MP3’s work, by only storing the information that the user can hear, I guess. This was another experiment, where I wanted to see if I could remix an existing (and brilliant) SID tune, but only using a SID. I’ve heard (and made) a number of remixes on Remix64, but wanted to attempt to do the same – and hopefully be better – than a lot of those, but with nothing but a SID. This was far more difficult to do than Turrican! I initially converted the whole of Sanxion to SidTracker64. So, all of the patterns and instruments. So at this point, I had a version of the track that ran on ST64 in 4x speed (something I’ve been doing since Forth – It’s how I can get the definition on the clap and snare…). Only at that point could I start remixing. I didn’t want to completely destroy the feeling of the original, but I wanted to change it enough to make it worthwhile remixing. It was difficult to gauge what I could do to keep that balance. Also, the whole track is basically based around ringmod and sync instruments. What this means is that the sound of, say, the lead instrument, is effected by another instrument. So, if I modify one instrument for the remix, it could easily mess up another completely. Likewise, even when porting to ST64, if an instrument wasn’t created exactly as the original, or if I used the wrong note, it could make the whole thing sound wrong. But, it seems that a lot of people like the result. I knew it would be down to personal taste, as the original track is so iconic. I knew some just wouldn’t like it. I can live with that. – Is there any chance for us to enjoy your music on a C64 demo or a game perhaps? What are your plans for future 64 scene releases? – Maybe, but not in-game, probably. Main issue is that I’ve no interest in writing 50/60hz music for SID any more. I’ve done that 30 years ago, and it’s only now that I’ve got some tricks that only really work at 200hz (4x), that I’m enjoying writing music – and that people are hopefully enjoying listening too. I’m also not sure how much longer I’ll write SIDs for. I’m enjoying it at the moment, but as I’m not in any demo teams or anything, I’m not under any pressure to write anything. I was asked to join a number of great teams, but I declined just for this reason. Recently, just in time for Sanxion, Dr.J and Shine asked if they could create some graphics and code to play my SIDs for the .PRG file. So, they’ve kindly donated their time and effort to give me a nicer looking screen for the PRG now! But, as far as collaborations go, this is as far as I really want to go at the moment. – What does a C64 computer represent to you? Why should any composer/artist bother to work with the SID? – The C64 is why I’ve had a long and wonderful career in the games industry. It’s why I’ve met a lot of amazing people (including my wife). Sounds rather corny, doesn’t it?! But, it is actually true. I joined Graftgold in 1988, and my wife-to-be joined as an artist in 1992-ish. I’ve a new found respect for the SID now. Again, having a 25 year gap since last using it gave me a lot of time to see it for what it is – A great sound chip. And as such, I just looked at it from this angle. I hadn’t actually got back into the scene until Sixth (the first to be released on CSDB), so before that, I honestly hadn’t listened to any SID music that had been released since 1990. I’ve often told budding game composers to look at what the C64 did, as it showed us all how any boundary can be pushed further. I think every university who ran a course on game audio should honestly get their students to understand how at least one of those great tracks were written. – Emulator or the real thing? – Don’t really care! I write for 8510 R5 (as this is what SidTracker64 uses). And I guess most people listen through SidPlay or such like, so emulators are OK by me. I’m honestly not that bothered. The emulators are close enough for me. The SID’s are recorded by others on real hardware (for example, in the Immortal64 podcast), so I’m happy with how they sound on the C64 too. I expect it to be a bit different. But, likewise, I expect each listener to be hearing it through different speakers / headphones or whatever anyway. I’m guessing there’s a lot of people with C64’s who have it connected to a 1080p LCD TV.. So it would sound a lot different to how my C64 sounded on a 12 inch black and white CRT TV in 1988! – What more do you expect to see, “popping” up from an old C64? Is there anything that came as a surprise to you in any of the new C64 releases? – Since getting back in the scene, I’m just blown away by the demos. The graphics and the tricks that I just wish I’d known at the time. But again, how much of this is only possible due to emulation? Where you can quickly and easily try things out without the whole thing crashing and you losing all of your code! I’m not sure what will pop up next. The machine is a monster. It just keeps on giving. – Would you encourage some new talents to join the C64 scene world? – If they were interested, I’d happily help encourage them. – “SID music is obsolete!” What’s your response to that? – It’s far too influential to so many people to ever be obsolete. There’s obviously some people who listen to it daily, and others that are just influenced by what they heard 30 years ago. Both are equally part of the SID story. – Two words about your prolific composing experience to other systems as well? What do you think are your milestones and for which system? 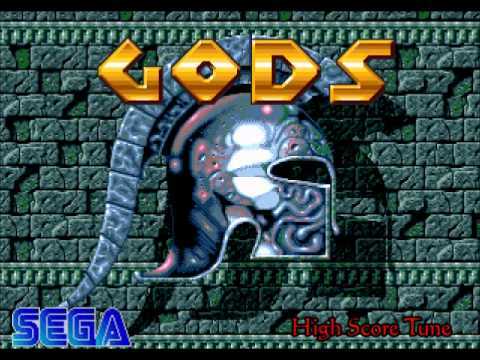 – I ported Gods from the Amiga to Megadrive when I was at Graftgold. That was a good project. Got me to know the late, great, Richard Joseph well, which resulted in me working for him for a year between 1994-1995. I worked on the music for 20 games in that year. During this time, I worked on the music for the Amiga game Ruff & Tumble. I guess Gran Turismo (PlayStation One) has to be one of them. A really enjoyable experience. I was initially asked to write some music for “some Japanese race game”, where the original Japanese music wouldn’t suite the European audience. So, I had about 2 weeks to write a lot of music. Turns out that people still like it today, as there’s quite a few YouTube videos of the music. – Apart from C64 (! ), which platform you find most enjoyable to work with? – I also really liked working on the Megadrive. It felt like a 6 channel SID to some extent. – How rational or feasible is the combination of a SID music tune (made and special tailored from and for a SID chip) with a modern commercial game or prod? Is a SID tune able to provide inspiration to a rookie music developer? – Sure. It’s got a unique sound that can stand out. Like anything, it has to be used in a way that suits the game. – What’s your opinion about the sound chip of the Original Playstation? Was it ahead of its time? What about the sound quality capabilities compared to the Sega Saturn sound system? – The SPU was… OK. It had reverb and delay which was nice, and 24 channels of ADPCM sample playback. Trying to get perfect looping was always a pain. Of course, the main thing was that it could also play CD music. So, the PSOne was really all about the music. WipeOut (CoLDSToRAGE) music was very iconic. I got to write some nice music for things like the Official PlayStation Magazine demo disks, where a lot of them were 20 second loops (a single sample that filled all of the SPU’s sound RAM). I wrote an XM player for PSOne, which was released to the development community. Companies like Team17 and Codemasters used it in a lot of their titles. It allowed those who could write great tracker music to continue to do so on the PlayStation. – Why do you think the Original Playstation became so successful? – It caught the imagination of a lot of people due to the great marketing campaigns. Great games and hardware too, but it was the “cool” factor that did a lot. – How did you get your first opportunity in creating music for Playstation and PS2 games? – I joined Sony in 1996. At this time, I joined to work in the developer support area (which changed to R&D, where I stayed for the duration of my time at SCEE). There was only about 160 employees in the whole of SCEE when I joined, so I was also responsible for writing music and working with the game teams. I was basically the “audio person”. The first game I worked on was Porsche Challenge. I wasn’t meant to be doing the music for this, as it was going to be outsourced. However, the producer of the game couldn’t find anyone who was creating the sort of vibe that he wanted. I wrote something just to use as a place-holder for a demo. He asked me to write all the music at that point. From here, I just used to write music for everyone. First party titles, games that needed music to suite European tastes (Cool Boarders 2, Gran Turismo, ATV…), demo disks, promo videos for trade shows…Everything. – What were your likes/dislikes regarding the Playstation/PS2 sound system? – PS2 was a bit of a letdown. It was just 2 PS1’s really. 48 channels of ADPCM. Especially compared to what the Xbox was released with. We still pushed boundaries, and the MultiStream audio system that I wrote was used by many AAA studios. So, it was good to keep on trying to push hardware to do more than it was really meant to do! – On 18th of November you announced via your twitter account that you’re leaving Sony. How do you feel about that, what led you to that decision and what are your plans for the future? – Probably can’t say everything that I’d like to say here! But the company wasn’t the company that I joined nearly 20 years earlier. It was far larger, and as such far more difficult to do things that I once found simple. I didn’t feel like I could help developers make great games any more. Also, middleware had meant that it was very difficult to help anyone, as it wasn’t possible for me to write code that would help them on another platform. I’d also moved out of game audio composition. I decided to focus on the R&D and programming side, so I wasn’t having as much creative “fun” any more. As I said, times changed. It was just the right time for me to leave. – Could you suggest any site link(s) that we can reach you and listen to (or download) your latest tunes? Αυτά είναι! Γουστάρω να διαβάζω ιστορίες για Playstation, Saturn και τέτοια! Για μένα ο Jason είναι αυτός που η μουσική που γράφει είναι καθαρά για games και ας μοιάζουν λίγο τα κομμάτια μεταξύ τους. Δίνει το κάτι παραπάνω στην όλη ατμόσφαιρα-φιλοσοφία του παιχνιδιού. Νομίζω πως ταίριαζε πολύ με την εποχή Playstation, PSOne. Well done Γιώργο! Συνέχισε δεινόσαυρε των retro! Φαβερή συνέντευξη Γιώργο, φοβερό άτομο και ο Jason, θα έχεις να το λες αυτό !!! Ευχαριστώ παιδιά ! Αχχχ…Ο μαγικός, μοναδικός ήχος του SID !!! Συναρπάζει ακόμη και σήμερα…και για πολύ καιρό ακόμη ! Ευχαριστώ όλους αυτούς τους μουσικούς που με το ταλέντο τους κρατούν ζωντανή την Demo Scene του C64, ζωντανή ! Ρε συ George… είσαι Μέγας! Οι φίλοι που φιλοξενώ, κάνουν όλη τη δουλειά κι εγώ απλά σας την μεταφέρω ! Συγχαρητήρια Geo. Ανεκτίμητες γνώσεις. Δεν νομίζω ότι έχει γίνει μέχρι τώρα τέτοια έρευνα και τέτοιες συνεντεύξεις από μεγαθήρια. Post το link και σε άλλα sites ξένα. Όλοι τους σημαντικοί εξακολουθεί να μου αρέσει περισσότερο ο KATOD, από θέμα compositing, στησίματος(studio) , φωτογραφίας. Σε ευχαριστώ Αντώνη ! Η άποψη σου σε θέματα περί φωτογραφίας, έχει ιδιαίτερη βαρύτητα και μετράει πολύ για μένα ! Για ακόμη μία φορά, Γιώργο μας καθήλωσες ! Είναι μεγάλη επιτυχία να συνομιλείς με έναν άνθρωπο του χώρου των videogames όπως είναι ο Jason Page. Η ενασχόλησή του με τη μουσική σε μηχανήματα όπως ο Commodore 64 και το Playstation είναι ο τέλειος συνδυασμός για μένα. Ήταν πολύ ενδιαφέρουσες οι λεπτομέρειες για τις μουσικές του δημιουργίες, όπως το remix του Sanxion (για πολλούς, το καλύτερο μουσικό θέμα στον C64) και η μουσική στο menu του Gran Turismo! Σε ευχαριστούμε πολύ, όπως και τους Χρόνη, Δημήτρη και Νίκο για την επιμέλεια και τη δημοσίευση αυτής της συνέντευξης. Υ.Γ. Εννοείται ότι “κατέβασα” τα .sid του Jason για το Sanxion και το Turrican! Thanks Chris ! Το μουσικό σου αυτί, έπιασε την ποιότητα της δουλειάς του Jason !